Most people turn to yogurt when they want to get probiotics through their food. Unfortunately, commercial yogurts are made from conventional dairy (pesticide sprayed grain fed, pumped with hormones and antibiotics), that is pasteurized, colors and flavorings, and loaded with sugar and/or artificial sweeteners. When you consume kefir, you get even more benefit because kefir can actually colonize your gut! (Yogurt can’t do that). This is perfect for those who are dairy intolerant or who just want to avoid dairy altogether. Make it a regular part of your diet and ditch the commercial yogurts! 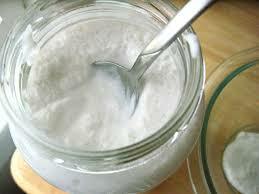 Combine the kefir starter with the coconut milk in a glass jar (do not use metal to store or stir). Cover with a cloth secured with a rubber band and let it sit (it should be fairly warm for proper fermentation. If your mixture has not thickened after 24 hours, it probably was not warm enough) for 12-24 hours. After about 12 hours, gently shake the mixture. Try it! Once the coconut milk has thickened and turned slightly sour flavor, you’re done. Strain the mixture through a fine plastic strainer and store in the refrigerator.